You will love this easy and delicious Homemade Almond Milk Recipe and it is so much better for you than the store bought version and so much healthier too. Have you discovered Almond Milk yet? We have and we have never looked back. When we went on the Paleo Diet we had amazing success and Almond Milk was a recommended substitute. In our family, we love it so much that we have swapped it out completely in our house. It’s dairy free and very creamy. We use it in our Coffee Pod Machine with great results. 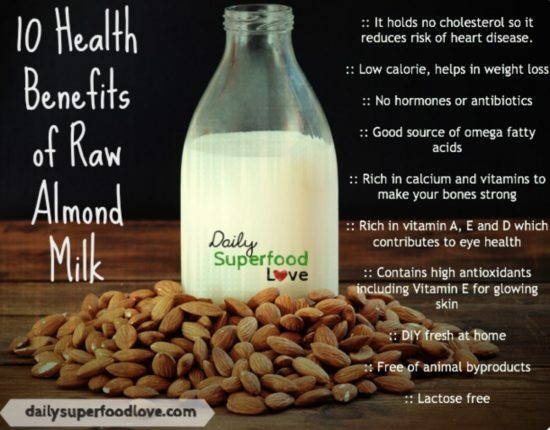 Alex from Daily Super Food Love is a fan of Almond Milk too. Her infographic outlines some excellent health benefits and why you should be making the switch. It’s Lactose free, has no antibiotics or hormones, is free of animal byproducts and is high in Omega Fatty Acids. It can also be used as a base for Smoothies Recipes too. Please note that you will need to soak your Almonds for at least 8 hours prior to using them. Be sure to take this into consideration when you are making this recipe. We have included a video tutorial from Megan at What’s Up Moms that shows you how to make your own Homemade Almond Milk Recipe in the comfort of your own home. 1. Cover almonds in water and soak at least 8 hours, preferably overnight. Or cover in boiling water and soak for an hour. 2. Drain almonds, and add to blender. Add 3 ½ cups filtered water and blend for about 1 minute, until almonds are finely blended. 3. Strain in nut bag, jelly strainer, or fine mesh sieve. 4. Stir in flavors if desired. Refrigerate and enjoy within 3 days.